The carefully vetted text and images are the first to cover the full range of bird life in this vast and varied country. The more than 1800 up-to-date accounts treat the Yellow-nosed Albatross to the Sombre Hummingbird, the Ash-throated Gnat-eater to the Black-bellied Whistling-Duck, Nighthawks and Jacamars to Motmots, Puffbirds, and Peppershrikes. 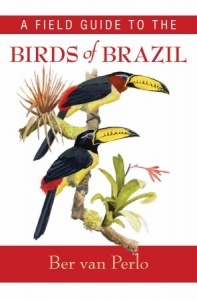 They are all here - every species and many subspecies found in each region of Brazil - with special attention given to the 218 Brazilian endemics. The book is laid out so that the illustrations sit across from the commentary and the distribution maps, so it is easy to use. Also, the author uses short-hand notation throughout, to make the book compact and easy to carry when in the field. For each bird, the scientific, English, and Portuguese name are given as well as detailed information on measurement; identifying features; habitat; voice, song, and call. Distribution maps show the range for each species, also indicating seasonality and occurrence, essential for finding and identifying specific birds. From the equatorial North to the tropics, the introductory paragraphs set the stage in describing Brazil's varied biogeography, climate, geomorphology, and natural vegetation. A list of protected areas of Brazil, information on relevant national and international organizations, a bibliography and further references, and an English-Portuguese dictionary of frequently used terms enhance the user-friendly qualities.